YORKVILLE — The design for a new gym planned for Asphalt Green uses an interactive system of LED lights, pressure-sensitive floors and black lights to guide people through a workout. The East 90th Street sports and fitness center unveiled renderings this week of a $2.2 million renovation of three floors in its Murphy Center — including revamping the multi-purpose and small turf training area on the second floor with a PRAMA system, which Asphalt Green's Chief Operating Officer Jeff Dorn described as "like Dance Dance Revolution on steroids." 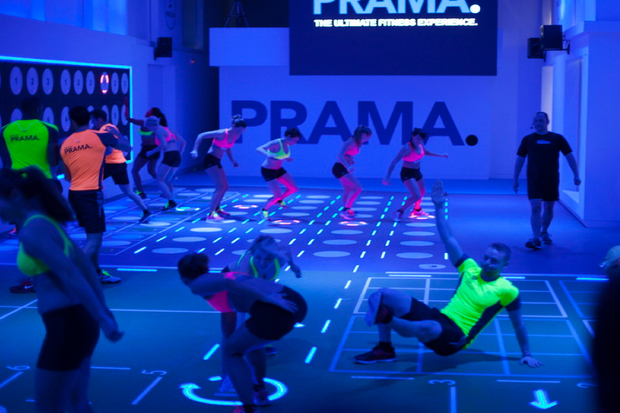 In the PRAMA system, the gym is divided into various sections where individuals and teams are guided through a workout using LED-lit and pressure-sensitive floors and walls, which respond when users interact with them. For instance, circles will light up, showing participants where to step, jump or throw a basketball, and once the user touches the correct circle, the LED light will turns off and the next one will light up. The gym also has a night feature, which activates the black lights, creating an environment similar to a scene in "Tron," Dorn said. Two other floors at the Murphy Center will also get an upgrade. The third floor, which was used for martial arts, will be replaced with a spinning studio, "not to compete with Soul Cycle, but for members and the community," Dorn said. Mazur Hall, a presentation and performance space on the first floor, will be upgraded with a new audio/visual system, new wooden floors and new retractable seats, according to the plan. A turf soccer field was recently constructed on the fourth floor to accommodate growing demand for the sport. The Murphy Center opened in 1984 and was last renovated in 2002. The new upgrades will begin in earnest in 2016 and extend into 2017, according to Maggie Siegel, Asphalt Green's executive director. "Our innovative sports performance center is being designed with the competitive athlete in mind, and will be focused on all the key elements that create the highest performing athletes," she said in a statement. "There will be components that all New Yorkers who want to take their fitness to the next level can participate in as well, and it's going to be unlike anything else in New York City." The organization is also working on upgrades to its aqua center, but those plans have not been finalized yet.